Over the last couple of weeks, a lot of people have shown their true nature. Many have been trolling my comment section like a bunch of pre-pubescent gender neutral school children — others with tactical God complexes, have tried relegating me to nothing more than a talking monkey by throwing money at me challenging me to 2A tactical phallus-measuring contest. Then there’s the Tactical boudoir IG “model” who thinks writing a lengthy Instagram message accusing me of not caring about A RIGHT I DEDICATED MY LIFE TO makes her ambiguity of cleavage IG page more relevant than the documented 12+ years of fighting for this right, 7 of which on the front line. I’ve made my mental notes and placed these people in their appropriate boxes, and that’s the last I’ll speak of them. I know there are genuine supporters who have questions about my stance on the bump stock debacle. I don’t owe anyone anything, the same way you all don’t owe me anything. However, all things considered, many of you have supported me for years, and I appreciate and love you all for it. There’s a lot of people clout chasing and exploiting this bump stock mess to build personal brands, organizations and get donations. I can’t control that, but I can control the way I respond to it. Below is a podcast I did over a year ago with Tavis Smiley. During this podcast, I gave my personal stance on bump stocks (nothing about my position has changed). I’ve also included the NRA’s most recent statement (December 21, 2018) on bump stocks and the Comment’s submitted (June 18, 2018) by the NRA to the ATF explaining why the bump-stock did not meet the mechanical test standard necessary to re-classify the bump stock as a machine-gun. I will always fight for this right the best way I know how, whether I have only 1 follower or 2 million followers. 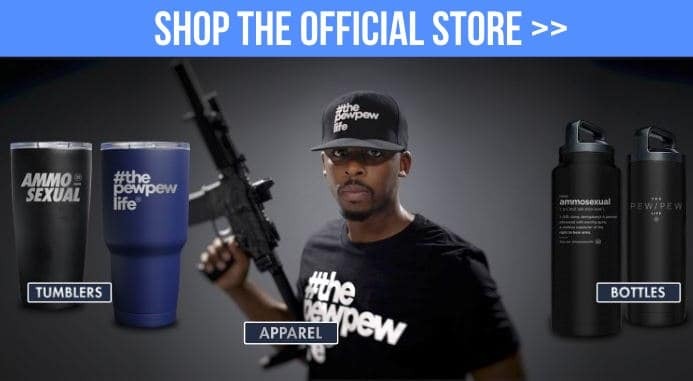 The Pew Pew Life will forever and always be about THE PEOPLE (ThePPL). This week, the Department of Justice announced that it would soon be releasing a final rule classifying “bump-stock-type-devices” as “machineguns” under the National Firearms Act. Click Below to see comment’s submitted (June 18, 2018) by the NRA to the ATF explaining why the bump-stock did not meet the mechanical test standard necessary to re-classify the bump stock as a machine-gun.